Some consider Lucien Freud to be England's most brilliant contemporary portrait painter. Others say the Queen should put him in the tower for painting such an ugly portrait of her. Note This is a continuing work: I will continue this analysis into the psychological, compositional and stylistic elements of freud's portrait of the Queen as my time permits. Freud was approached by a royal representative with regard to painting a portrait of the queen. put this next part somewhere else Aside from maintaining artistic integrity Freud requested the type of crown to be worn by the Queen during her sittings. The role that the shape of this crown plays in the overall composition will be discussed later but first we will discuss the emotional dynamic of portrait painting. The portrait painting stage consists of the sitter, the artist and the painting. The sitter wants the image created and the artist wants to create the image.The painting is the resultant interaction between the sitter and the artist. and is therefore deemed to be the primary image. The sitter and the artist enter into a psychological struggle as to what aspect of the sitter the portrait is to portray. This psychological dynamic or struggle takes place between the primary and secondary images during the sittings. The painting is the resultant interaction between the sitter and the artist and is therefore titled the primary image under the control of the artist and the secondary image title is given to the sitter's control over the primary image. The more the primary image becomes a superficial imitation of the sitter the sitter's social position the more the primary image is diminished. It becomes more of an inventory presentation of social position than an artistic exploration of a human being. How the painting turns out will depend upon this dynamic - but complications occur when the painting is being paid for. A sitter paid painting is one complication and a sponsor paid painting is another. The social power of the sitter is another. The emotional power such as being lover etc is another. Freud painted the Queen's portrait for free - thus eliminating the money power aspect of the sitter artist dynamic. It was a dynamic between the Queen and her portrait painter. 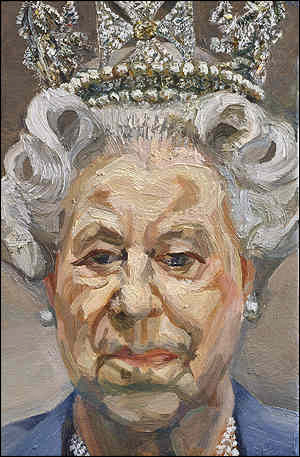 Some say he painted the ageing Queen as ruthlessly as he had painted his ageing self. There may be something to be said for an artist and a Queen both coming to terms with death and no longer concerned with the image of youth and power. The traditional purpose of the royal portrait is to declare the imortality of the class system. Reverential appearance loaded with symbols of power and deference to position becomes the cultural norm. Freud's portrait composition has focused on the top front part of the Queen's neck, face and bottom to middle part of her crown. There are no symbols to indicate her true social position. Freud does not provide her face with a smooth sensual paint finish meant to replace the beauty of her past youth. He hints at his ability to accomplish that wizardry on the collar and background of her blue jacket. He does not present her to the world as just another vain old Queen. The Queen and her artist have agreed and in that agreement they both equally created a strong primary image. It is a royal portrait masterpiece that now occupies a position in the royal collection. I have surrounded the Queen's portrait with a variety of photos gleened from the web. The purpose of these photos is to illustrate that a single photographic image only conveys a moment in a persons emotional life. Our post modern age challenges traditional cultural norms declaring that nothing is sacred not even the idea of god or god's word can be accepted without question. Elizabeth II has over the decades of her reign shown her ability to stear her course through the ever changing modern world of conflicting ideas, public scrutiny and mass communication. She has once more taken the bull by the horns in allowing this modern portrait to express the human over the traditional divine unapproachable image of the monarchy. At the artistic level the portrait derives its power by having the forms struggle to contain an inner outward pushing force - in this instance the struggle of forms suppressing a smile. For the Queen to have her portrait forever show the containment of personal laughter is an historic way for her to mark the new millennium. Meanwhile you may analyse the proportional system used and consider the method used to evoke tension between the spiritual and physical elements of the human condition. Check back and see if your analysis is comparable to my own. Hint- study rising and falling forms in sculpture as well as visual and tactile concepts of art.